We’ve just returned from a very enjoyable departmental party at Ben’s work. The pure maths department is very small so it was a small and friendly gathering. There were some other kids there and they paired up with our kids and spent the time tearing about the place and burning off energy. We cycled there and home again and it was glorious. I love cycling so much. The dome-shaped building in the background is the home of pure mathematics and engineering at the University of Aberdeen. 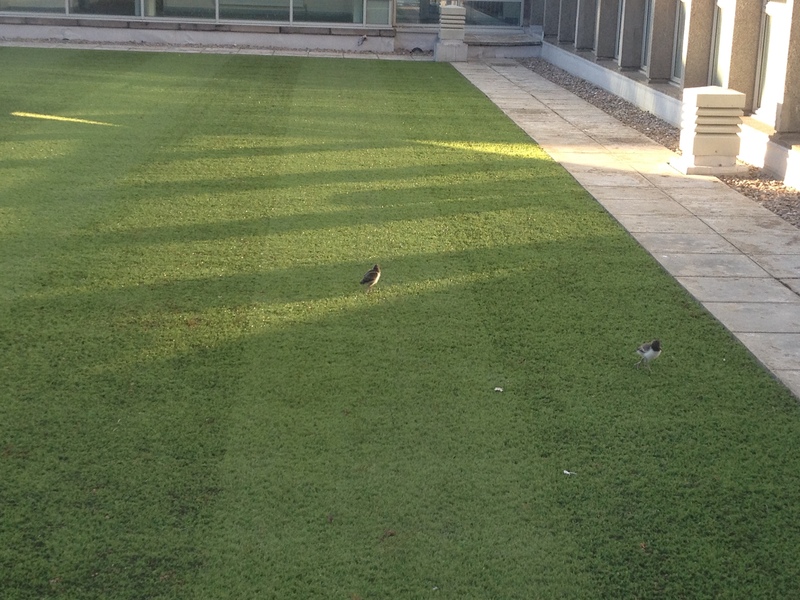 Their common room opens onto a nice little courtyard where some birds nest every year. There were two chicks there. I have no idea what type of birds they are. Does anyone know? 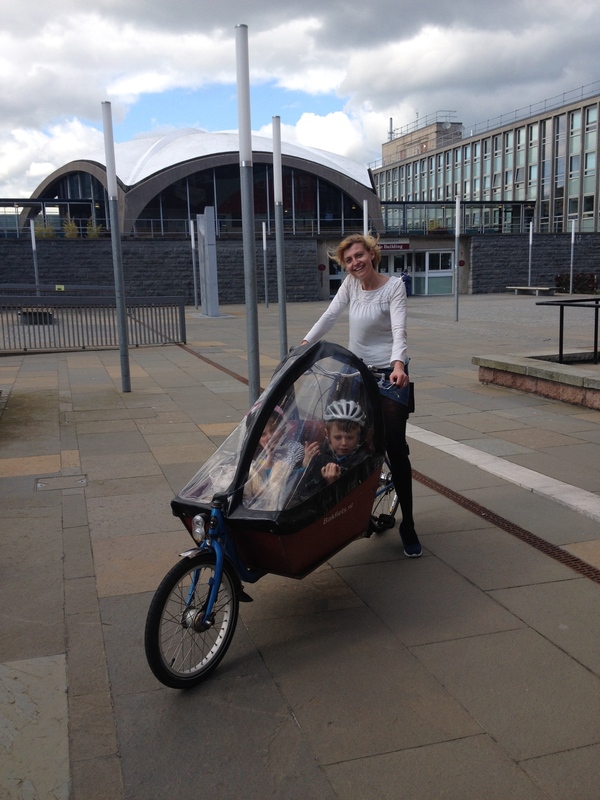 Posted in Journal and tagged bakfiets, birds, cargo bikes, cycling, nesting, party, University of Aberdeen. Bookmark the permalink. 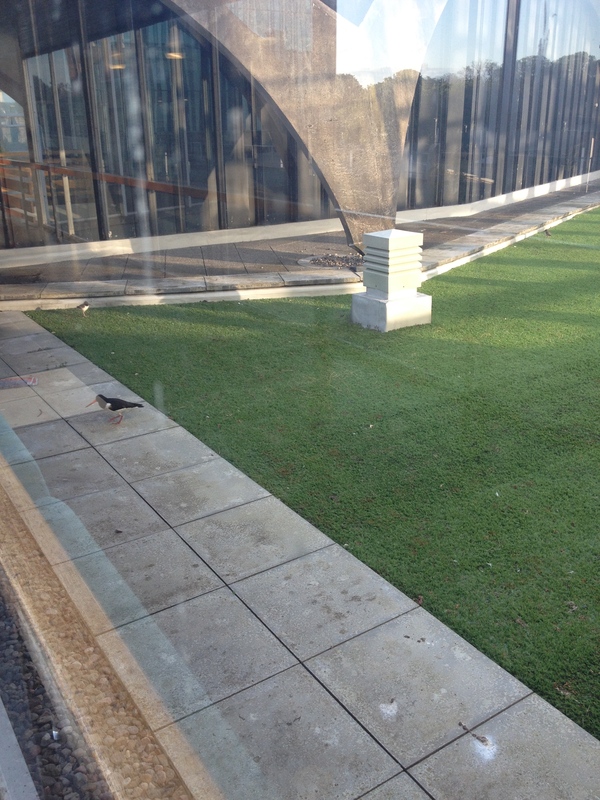 I like that building, with the grassy area too and so sweet to have birds there. It is a nice building which is a change from the usual buildings that mathematics departments can be found in. Apparently these birds nest here every year but last year seagulls ate the chicks. I think the chicks are probably too big now for that to happen this year. They look like Oystercatchers to me. Yes, they look just like them. Thanks! Correct me if I am wrong, but I think you have helmets on your kids. And yet Mom goes unprotected 🙂 Maybe you are wearing one of those invisible helmets. My sons partner has just completed her PhD and is looking for a teaching position at one of the local universities. She told me last evening that her father, who is chemistry professor in Germany, works closely with colleagues at the University of Aberdeen, and said it is beautiful there – one of his favourite spots. You have certainly confirmed that. Aberdeen University is really nice. There’s a lovely park just next door and it’s a huge park. The University is full of lovely old and modern buildings. I’m not such a huge fan of modern buildings but Aberdeen has some nice ones. haha. When I went outside to take a photo of the chicks it felt a bit like playing a game of hot and cold. As I got closer to the chicks the peep peep from the parents got faster and faster. As I moved further away it slowed down. Uni looks well maintained. Lawns are pristine.